Hi! I’m Michael from House House, which is a very small game company from Melbourne, Australia. We’ve spent the last two years working on our first game — a local-multiplayer sports game called Push Me Pull You — and today we’re excited to announce that we’re bringing it to PS4 next year. 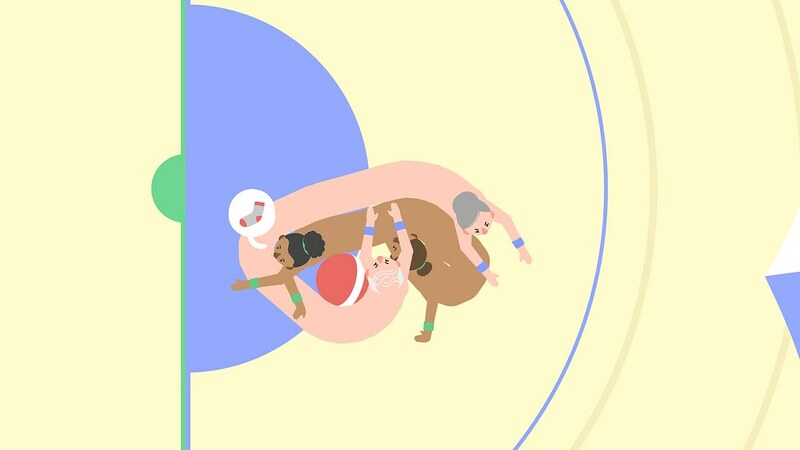 Push Me Pull You is a lovely and horrible two-on-two sports game that’s all about cooperation, because you are literally joined to your partner. Players need to work together to keep control of the ball, pulling it along or wrapping it up tight with their long stretchy torso. 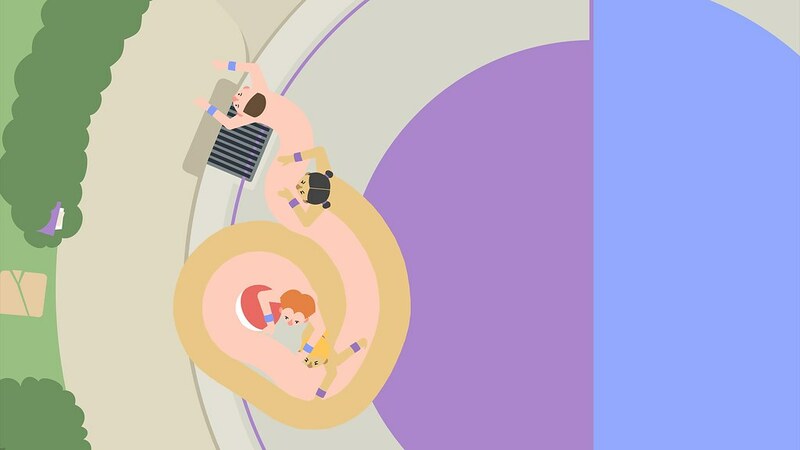 A game of Push Me Pull You consists of a big frantic mess of growing, shrinking, and stretching bodies, driven by our fluid, physics-based movement system. Since you can’t just pick up the ball with the press of a button, you’ll need to use your shared body to scoop it up and carry it, or wrap around it to protect it, or push it away so that your opponent can’t reach it, and so on. These freeform tactics evolve through consecutive games as players invent their own strategies and counter-strategies, resulting in an expressive system of play and a deceptively high skill ceiling. Character creation, so that you can decide what your character looks like before you smoosh its face into your opponent’s fleshy torso. 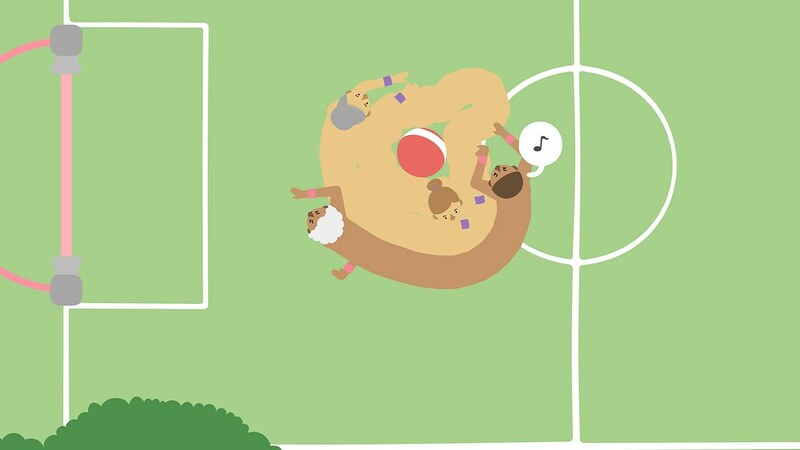 A set of alternative gameplay modes we’ve designed in addition to the competitive core game — Knockout, for instance, is a sumo-like variant that gives each team a ball that they’ll need to defend while trying to push the other team’s ball out of the ring. A wide open space to explore between matches, with a bunch of little toys and secrets, offering a space to play around with the game’s physics outside of the competitive game itself. Although we originally designed Push Me Pull You to be played by four people with four controllers, we knew that not everyone has a bunch of spare controllers lying around, and it’s not always easy to get four friends in the same room to play video games. With that in mind, we’ve designed it to be as accessible as possible, so it can be played with all sorts of configurations — from two to four players, and from one to four controllers. We’ve kept the control scheme simple enough that two players can share either side of a single controller, which is personally our favorite way to play — having to share means you end up wrestling your partner both on-screen and off. 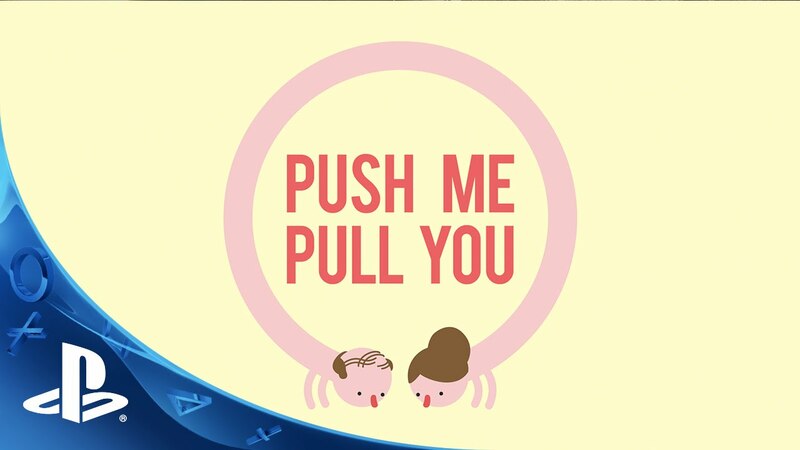 We’re really glad Push Me Pull You has found a place on PlayStation. From the beginning, we designed this game to be played by friends in the same room, with controllers, so PS4 is a perfect fit. We’re all relatively new to game development, and we’ve been fortunate enough to have our development supported through Sony’s Pub Fund program. It’s really exciting to be able to release the game on a platform so well-suited to our original intentions. We’re also happy to announce that Push Me Pull You will be playable at PlayStation Experience in San Francisco next month. If you’re at the show, come say hi! If you’ve got any questions about the game, feel free to ask them below. Wow, haha… this looks weird and possibly wonderful. The game mechanics look terrible, I want it. Realize you’re a small team – btw congrats on your upcoming launch – might there be any clothing/costume options down the line for our fleshy conjoined competitors? Hi! That’s lovely to hear, thanks. There’s not quite enough room on the one controller for four players, sadly – if you’ve only got a single controller, TWO players can share it (so if you’ve got four people that want to play, you’ll need two controllers minimum). We know that gathering together a bunch of controllers (or friends!) can be tricky, so we wanted to make sure our game had as low a barrier to entry as possible. Re: costumes – honestly, we’ve never really talked about it! From the start, this was a game about ~bodies~ and ~skin~ so the idea of covering them up with clothes sounds very strange to us. Professional sports in the universe of Noby Noby Boy? This is some kind of hell-spawn born in the unholy matrimony of Catdog and The Human Centipede. These things could genuinely be Silent Hill monsters, imagine them in 3D. This is going to haunt my dreams. Us too! PMPY cosplay would be a dream come true, though it sounds logistically tricky. That looks disturbing.. How do I get my family to play with me? All I can think about is Eddie Izzard, talking about lawn mowers. Still seems like a bizarre game though. Right up my alley. “lovely and horrible”… I’m glad Michael McMaster recognizes that this is indeed both. What a weirdly wonderful concept. The art style makes it endearing. Just imagine if this was full 3d with realistic graphics… That would be the stuff of nightmares! Any thoughts on a vita version? I could see this working well with one player holding one side of the vita, and player two holding the other side. You had me at Sportsfriends meets Noby Noby Boy. Will it be on Vita as well?